but out of a graceful will to make the Self known to you. whereas you are the one who presented the Divine with deeds? and what you present to the Divine Self! 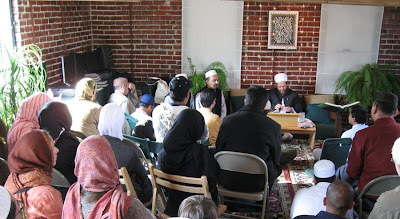 On the first weekend of November, 2008 the Green Mountain Branch of the Shadhdhuli School of Tasawwuf organized and hosted a two day seminar on Al-Hikam, considered a classical masterpiece in spiritual / sufi literature - written and compiled by sufi master of 13th / 14th century Ibn Ata Illah. Al Hikam is essentially a book of sufi aphorisms containing timeless and pure spiritual wisdom for the seekers of illumination. The Author of al-Hikam, Shaykh Ahmad ibn Muhammad Ibn Ata'illah as-Sakadari (d. 1309) is the third successor (khalifah) of the Shadhdhuli, one of the major sufi order. He was born and grew up in Alexandria (Iskandar), Egypt where he met his sufi master Shaykh Abul Abbas al-Murshi, the successor of Imam Abul-Hasan as-Shadhdhuli the eponymous 'founder' of the Shadhdhuli sufi lineage, May God be pleased with them all. Ibn Ata'illah is given the credit for the systematizing the teachings of his two predecessors who did not leave any written works. So the branch of Shadhdhuli school of sufism is truly indebted to him as well as the science of tasawwuf in general. His collection of aphorisms known as al-Hikam which are the pure nectar of the teachings of Shaykh ash-Shadhdhuli. The outer simplicity of al-Hikam veils the depth and profundity of their meanings and are best understood if read and considered over a long period of time, preferably under the tutelage of a shaykh with inner knowledge. During the 2 day seminar held at the Islamic Study Center in Charlottesville, Virginia - the distinguished speakers were Shaykh Muhammad Yahya Ninowy, Shaykh Nooruddeen Durkee and Shaykh Ahmed abdur-Rasheed who touched and commented upon the hikam of Ibn Ata Illah. Shaykh Abdullah Nooruddeen Durkee, the Director of Green Mountain School and organizer of the seminar started the seminar by giving a background on Ibn Atallah, the author of Al Hikam and his sufi lineage the Shadhiliyya School of Sufism. Shaykh Ninowy started his talk on Al-Hikam with an introduction to the science of tasawwuf or sufism. He is one of the most gifted speaker I have ever come across. Most of the audience was captivated with his heart-warming eloquence, depth of wisdom and sense of humor too, that he brought into the explanation of the hikam.
. talk 3 , talk 4 from November 2nd. Shaykh abdur-Rasheed also spoke on Hikam with insight and we had wonderful singing and praising (nasheed, hamds) by beautiful voices who made the seminar wholesome and touched everyone's heart deeply. [>] All of the audios from the seminar can be accessed via Green Mountain School's page of Al Hikam event.